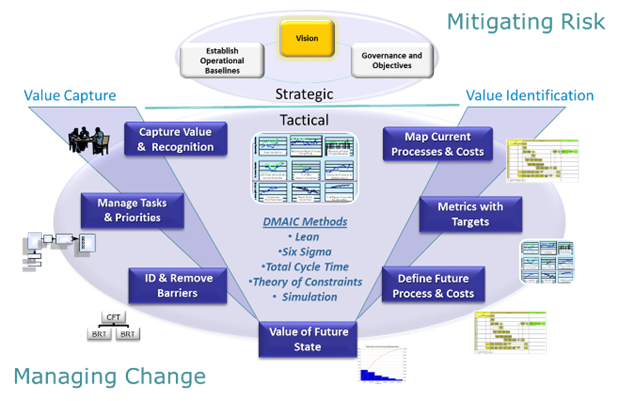 Our Operations Excellence methodology enables organizations to strategically and systematically eliminate waste in their systems -- whether focused in specific operational areas or enterprise-wide. Equally important, we support our clients as their organizations begin to understand change and deal with the consequences, to mitigate the risks, and ensure benefits "stick" going forward. Lean methodologies improve business performance by eliminating waste improving quality and flow, thus adding value and capacity. A Lean business produces exactly the results needed, when needed, without additional time, labor, or cost. The Six Sigma methodology is suited to solving complex problems using statistical tools to identify critical ways to improve productivity and to verify qualitative improvement. Our Operations Excellence approach begins with understanding the “As Is” state – the current condition of a process, followed by development of a target condition – how the process should operate. The methodology identifies and eliminates obstacles that prevent achieving the target condition. Our deliverables provide our clients with repeatable processes, methods and tools, customized to produce operations excellence in thieir businesses. With over 25 years’ experience providing Operations Excellence consulting to our clients, TransSolutions’ consultants have the expertise needed to adapt and apply our methodology to our clients’ specific project needs. Our passion is to find, develop and implement new, innovative, and agile solutions that will enable our clients to exceed their customers’ expectations for service and product deliveries.